Thank you all for your comments yesterday. I'm always blown away by how sweet and caring you all are, and also how many of you have been in or are in the same shoes that I'm in! It makes my day to read all of your kind words. I guess I figured since I make it all the time and it's pretty simple that I shouldn't share how I make it, but then some of you sent me questions about how to make it, so I decided to share really quickly because it is a super healthy and my go-to when my nights are really busy. Here is what I do: thaw out the tilapia fillets, place on a baking sheet, season tilapia with paprika, a pinch of sea salt and cayenne pepper, and then squeeze a lot of lemon juice on top of the fillets. I also cut up slices of lemon and place them on top of the fish and leave it on them to cook while in the oven. I bake the tilapia in the oven for about 10-12 minutes, at 375 degrees. Tilapia can taste pretty bland to me, so I like to add a little something something for on top. While the fish is cooking in the oven, combine the cherry tomatoes, onion, basil, and avocado in a small bowl. I like to add some red wine vinegar to this mixture and a little bit of EVOO...just a tad. I like to keep my recipes really simple so I don't add many ingredients or seasonings to keep them as healthy as possible. Once the fish is done cooking (it will be flaky when you cut into it), I top the fillets with the veggie mixture. As for the grilled zucchini and squash....I only season them with pepper normally and cook them in lemon juice and water until they get a little brown on both sides. Yummy and really healthy! Over the weekend, my girlfriend Angela and I crossed another brunch spot off of our list of finding the best brunch in Columbus. We went to Sage American Bistro, which is actually off High St. on Ohio State's north campus. Our verdict? We loved it. The service was fantastic, there was no wait, the restaurant was clean and really cute and trendy on the inside (exposed brick! ), and the food was delicious. I got what they call their Chorizo, Black Bean and Sweet Potato Hash, but I didn't get the chorizo. It came with two eggs, green peppers, yellow peppers, red peppers, and onions. The salsa it comes with on the side has a HUGE kick to it and is really flavorful. Absolutely loved this dish and would go back to get it! Angela got their Sausage Frittata and really liked it. She said the arugula on top was really tasty and she would get this again. The only complaint she had was that they charged her $5 for her orange juice and you didn't get very much and it wasn't that good, ha. The prices are on the higher side ($10-13 per dish), but we were really happy with the food so we didn't mind. Sage also has lunch and dinner that we mentioned wanting to check out sometime! I have heard such good things about Sage. My neighbor goes there all the time... it's my list of places to try as well. I sadly only live a short walk from it... but I ALWAYS forget about it! That looks amazing! Definitely giving it a try! Yumm that looks delicious! I have some fish in my freezer that I've been wanting to make, so I'll have to try this soon. Happy belated Anniversary too gorgeous! Looks absolutely delicious!! Do you leave the onions raw in the veggie mix? 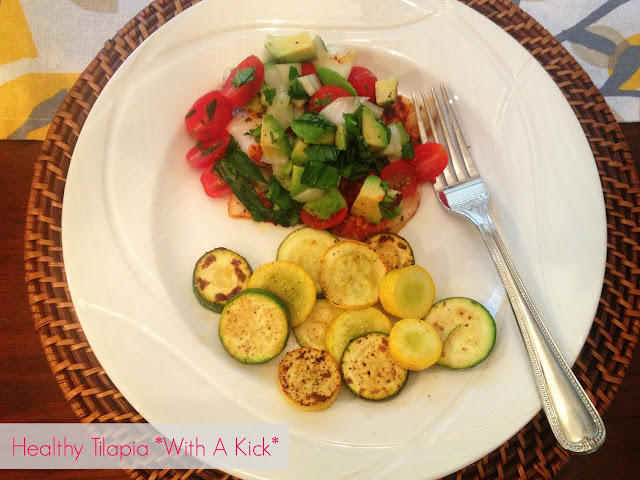 I love tilapia! This looks delicious!